Two documents lay out J.W.’s ancestry, early life, business dealings, civic life, and offspring. The statement of Macaulay that “A people that take no pride in noble achievements of remote ancestors will never achieve anything worthy to be remembered with pride by remote generations” has emphatic verification in each age and generation and he is indeed fortunate who can revert to ancestry whose record bears indication of worthy lives and worthy deeds. This is especially true in the case of John W. Wells, who is a scion of the family whose name has been identified with the annals of American history since the early part of the seventeenth century. In New England, that cradle of so much of our history, the family name has long been one of distinctive prominence and from that section have gone forth sterling representatives to aid in the development and upbuilding of many other parts of the Union. He whose name initiates this review came to Menominee, Michigan, as a young man and he has been most prominently identified with the great lumber industry of Wisconsin and northern Michigan, while as a citizen he has exemplified the utmost loyalty and public spirit, contributing generously to the support of those measures and enterprises that have conserved the progress and substantial upbuilding of this favored section of the Wolverine state. He is one of the essentially representative business men and most honored citizens of Menominee, where he has long maintained his home and where his interests are large and important. 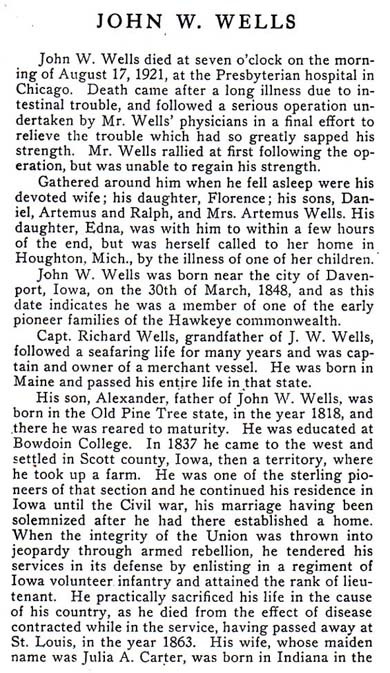 John W. Wells was born near the city of Davenport, Iowa, on the 30th of March, 1841, and as this date indicates he is a member of one of the early pioneer families of the Hawkeye commonwealth. As already stated, the Wells family, which is of stanch English origin (the town of Wells, England, being founded by the Wells Family), was founded in America in the Colonial epoch, the original progenitors in the new world having come hither as early as 1635. Members of this family were numbered among the first settlers of the state of Maine, and the town of Wells, York County, that state, was named in its honor. Captain Richard Wells, grandfather of the subject of this sketch, followed a seafaring life for many years and was captain and owner of a merchant vessel. He was born in Maine and passed his entire life in that state. His son Alexander, father of John W. Wells, was born in the old Pine Tree state, in the year 1818, and there he was reared to maturity. 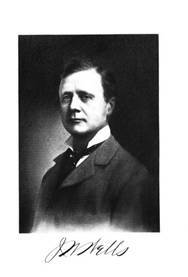 He was accorded excellent educational advantages and was educated at Bowdoin College. In 1837 he came to the west and settled in Scott county, Iowa, then a territory, where he took up a farm. He was one of the sterling pioneers of that section and he continued his residence in Iowa until the Civil war, his marriage having been solemnized after he had there established a home. When the integrity of the Union was thrown into jeopardy through armed rebellion, he tendered his services in its defense by enlisting in a regiment of Iowa volunteer’ infantry and attained the rank of lieutenant. He practically sacrificed his life in the cause of his country, as he died from the effect of disease contracted while in the service, having passed away at St. Louis, in the year 1863. His wife, whose maiden name was Julia A. Carter, was born in Indiana in the year 1820 and her death occurred at Menominee in 1900. Her father and mother were natives of Virginia and representatives of old and prominent families of the historic Old Dominion. He served with distinction as a soldier in the Mexican war, in which he held the rank of captain. He was numbered among the very early settlers of Iowa and was a member of its legislature in the territorial days. Alexander Wells and his wife were both devoted members of the Methodist Episcopal Church, and the former’s political allegiance was given to the Republican Party from the time of its organization until his death, only a few years later. He and his wife became the parents of seven children, of whom the following are now living: Mary is the widow of William Hollenbeck, who served four years in the Civil war as a member of the Twentieth Iowa; Alfred C., who served during the Civil war, in which he was a non-commissioned officer of the Second Iowa Cavalry, is now a resident of Iowa; John W. is the immediate subject of this sketch; Sarah A. is the wife of William Lamphere of Rapid City, South Dakota; James L. maintains his home in Evanston, Illinois. The father served for many years as a justice of the peace and as postmaster. He was a man of distinctive prominence and influence in his community and his name has an enduring place on the roster of the honored families of the fine Hawkeye commonwealth. 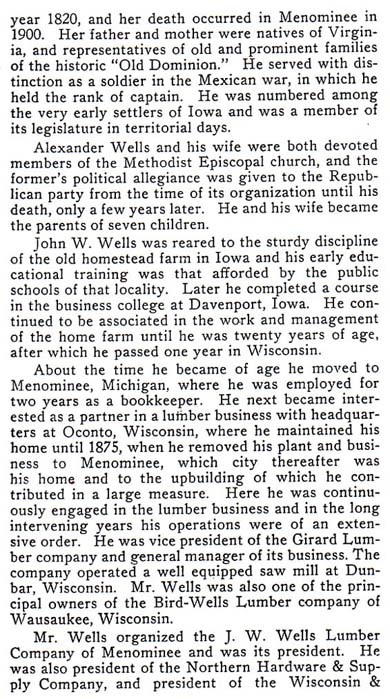 John W. Wells was reared to the sturdy discipline of the old homestead farm in Iowa and his early educational training was that afforded by the public schools of that locality. Later he completed a course in the business college at Davenport, Iowa. He continued to be associated in the work and management of the home farm until he was twenty years of age, after which he passed one year in Wisconsin. About the time he attained to his legal majority he came to Menominee, Michigan, where he was employed for two years as a bookkeeper. He next became interested as a partner in a lumber business with headquarters at Oconto, Wisconsin, where he maintained his home until 1875, when he removed his plant and business to Menominee, which city has since represented his home and to the up building of which he has contributed in a large measure. Here he has continuously been engaged in the lumber business and in the long intervening years his operations have been of extensive order. He is vice-president of the Girard Lumber Company and is general manager of its business. The company has a well equipped saw mill at Dunbar, Wisconsin. Mr. Wells is also one of the principal owners of the Bird-Wells Lumber Company of Wausaukee, Wisconsin, the mill of which corporation turns out about twenty million feet of lumber annually. Of this Company he is President. 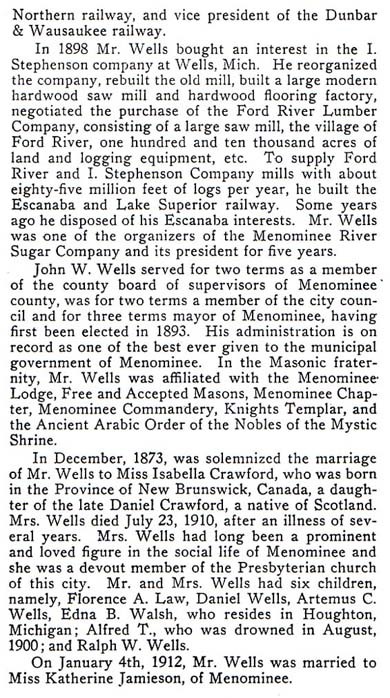 Mr. Wells organized the J. W. Wells Lumber Company of Menominee, of which he is president. He is also President of the Northern Hardware and Supply Company, wholesalers of lumbermen’s and miners’ supplies and general hardware. He is also President of the White Pine Lumber Company, a family corporation consisting of himself and his three sons, Daniel, Artemus and Ralph. This company operates in Ontario, Canada, where they own two townships of pine timber, a logging railroad, a large saw mill and everything necessary to carry on an extensive business. Mr. Wells is also President of the Wisconsin and Northern Railway, and Vice President of the Dunbar & Wausaukee Railway, which roads supply the Dunbar & Wausaukee mills with logs and also do a regular railroad business in connection with the Chicago, Milwaukee & St. Paul Railway, the Soo Line and the Wisconsin and Michigan Railway. In 1898 Mr. Wells bought an interest in the I. Stephenson Company at Wells, Michigan. He re-organized the company, re-built the old mill, built a large modern hardwood saw mill and hardwood flooring factory, negotiated the purchase of the Ford River Lumber Company consisting of a large saw mill, the village of Ford River, one hundred and ten thousand acres of land and logging equipment, etc. To supply Ford River and I. Stephenson Company mills with about eighty-five million feet of logs per year, he built the Escanaba and Lake Superior Railway, consisting of about one hundred and forty miles of track with first class rolling stock and equipment. He has recently sold his interest in the Ford River, I. Stephenson and Escanaba & Lake Superior Railway Companies at a handsome profit and will confine himself closer to personal operations. He is at present building a very large hardwood flooring and manufacturing plant and saw mill at Menominee to more closely utilize the lumber from his Wausaukee, Dunbar and Canadian mills. Mr. Wells believes in employing his sons in the active operations of his enterprises and they all own substantial interest and fill responsible positions in the business. Mr. Wells is one of the substantial capitalists of the Upper Peninsula, and his entire course as a business man and citizen has been guided and governed by the highest principles of integrity and honor so that he has ever been the recipient of the fullest measure of popular confidence and esteem. In politics Mr. Wells gives unqualified allegiance to the Republican Party and he has rendered efficient co-operation in the promotion of its interests in a local way. He served for two terms as a member of the board of supervisors of Menominee county, was for two terms a member of the city council and for three terms also he had the distinction of holding the office of mayor of Menominee, having first been elected on the first of April, 1893, and having been chosen as his own successor in the election of 1895-6. His administration is on record as one of the best ever given to the municipal government of Menominee. In the Masonic fraternity Mr. Wells is affiliated with Menominee Lodge, Free and Accepted Masons, Menominee Chapter, Royal Arch Masons, Menominee Commandery, Knights Templars and Ancient Arabic Order of the Nobles of the Mystic Shrine, in the city of Marquette, Michigan. In December 1873 was solemnized the marriage of Mr. Wells to Miss Isabella Crawford, who was born in the Province of New Brunswick, Canada and who is a daughter of the late Daniel Crawford, a native of Scotland. Mrs. Wells died July 23, 1910, after an illness of several years. Mrs. Wells had long been a prominent and loved figure in the social life of Menominee and she was a devout member of the Presbyterian church of this city. Mr. and Mrs. Wells have had six children, namely: Florence A. Law, a resident of Menominee; Daniel, formerly First Lieutenant, Thirtieth U. S. Volunteers and a veteran of the Spanish war who resides in Detroit; Artemus C., who resides in Menominee; Edna B. Walsh, who resides in Houghton, Michigan; Alfred T., who was drowned in August, 1900, and Ralph W., who is superintendent of White Pine Lumber Co., operating at Blind River, Canada. I find it a bit ironic that my Great, Great Grandfather Schuyler Williams … a commercial fisherman and original owner of the land which is now J.W. Wells State Park…Schuyler sold the land in 1935 to Wells for $900…and now I live in the Wells Circle…since 1980. Wonderful to hear from another Robert with closer ties to Menominee than I’ve ever had! I just approved your posts to appear on the Menomineewellses.com website, for which many thanks. I visited two of the Wells houses in around 1953 (a guess). My Uncle Ralph and Aunt Frances Wells were very much alive when we visited — probably in the home that was J.W.’s since I recall a dock outside? — and, just up the street, the home of my Uncle Charlie Law, husband of my then-late Aunt Florence Wells. Given how many generations have passed since, it makes me feel rather ancient having met these two of J.W.’s kids. The one I knew best, for years, was my grandfather, Daniel Wells, who was born in Escanaba but made his way down to Detroit, where my father, Daniel Lennox Wells, was born and where I spent my youth. Wonderful to hear from another Robert with closer ties to Menominee than I’ve ever had! I just approved your posts to appear on the Menomineewellses.com website, for which many thanks. I visited two of the Wells houses in around 1953 (a guess). My Uncle Ralph and Aunt Frances Wells were very much alive when we visited — theirs may have been J.W.’s house since I recall a dock outside — and, just up the street, the home of my Uncle Charlie Law, husband of my then-late Aunt Florence Wells. Given how many generations have passed since, it makes me feel rather ancient having met these two of J.W.’s kids. The one I knew best, for years, was my grandfather, Daniel Wells, who was born in Escanaba but made his way down to Detroit, where my father, Daniel Lennox Wells, was born and where I spent my youth. I was wondering if the family of J.W wells lived on 1st street in menominee?